Grill until almost cooked through, top with a little more chipotle salsa and add additional piece of cheese, finish cooking , cheese should be perfect and bacon will add to the smokiness of the Salsa. Serve on a Kaiser roll. The only thing that would add to this , would be top with a boneless rib, Then I’m getting my pork on!! Lori will receive a prize pack consisting of a $75 Meijer gift certificate, Bacon Nation Cookbook, Indiana Pork Apron, Colts hat, Colts yearbook and Colts 2012 Season DVD. 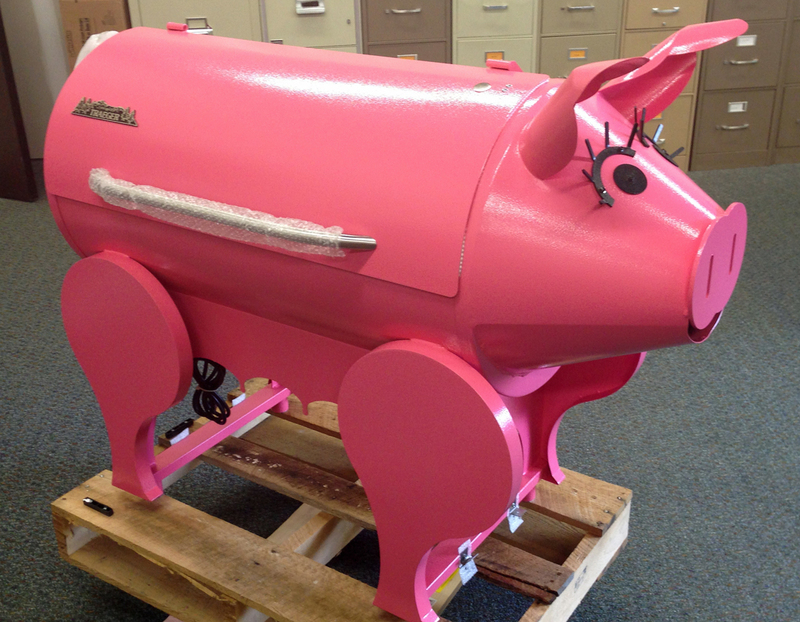 PLUS she will be entered into the grand prize which is the Traeger Lil’ Pig Grill. As Indiana state football champions are crowned this weekend with title matches being played at Lucas Oil Stadium, the Metropolitan Conference that is comprised with a strong nucleus of schools in the Indianapolis area has come in for very high national praise. According to the MaxPreps Computer Rankings formula, Indiana’s Metropolitan Conference ranks among the top 10 toughest high school football leagues in the nation. The conference ranks as the ninth-toughest nationally and is among other states known for football excellence – California, New Jersey, Ohio, Florida and Michigan. A state once known for national relevance in another sport now boasts one of the best football presences in the country, and it has been a pronounced trend for about the past 15 years. New Jersey, Big North – United League (Overall Rating: 66.4). California, Trinity League – (Overall Rating: 60.1). Ohio, Greater Catholic – South League (Overall Rating: 57.3). California – Serra League (Overall Rating: 53.4). Michigan, Catholic Central League (Overall Rating: 49.2). Maryland, Virginia, Washington D.C. – Washington Catholic Athletic Conference (Overall Rating: 48.9). Florida, 5A, District 2 (Overall Rating: 48.5). Kentucky, 6A District 4 (Overall Rating: 47.4). Indiana, Metropolitan Conference (Overall Rating: 46.8). Florida, 6A District 16 (Overall Rating: 46.6). Indianapolis ranks in the nation’s top 15 most populous cities, while the state ranks 14th in population according to recent Census Bureau numbers. Among the leagues rated higher than the Metropolitan Conference, only Kentucky has a smaller population (4,380,415) than Indiana (6,537,334). In the top 10 in the football leagues cited, New Jersey is 11th in population, while California is first, Ohio is seventh, Michigan is eighth, Florida is fourth and the area around the Maryland/Virginia/Washington conference is among the nation’s most densely-populated areas as well. For this week, the Colts are still searching for better starts after a 40-11 loss to the Arizona Cardinals? What are your thoughts on the Colts and Titans in a massive AFC South tilt this weekend? How do you think the final month of the season will unfold for the Colts? The calendar will turn to December this weekend and with that comes the intensity in playoff races. Sunday’s tilt between the Colts and Titans will explain a lot in deciding who will represent the AFC South this January. The Colts currently lead the head-to-series 1-0. The Colts also have the better divisional record at 3-0. The Titans are 0-3 in the AFC South. The Colts are 5-2 against the AFC. The Titans are 4-4. -The Texans dropped their ninth straight contest on Sunday. Houston was just 4-of-15 on third-down and gained 218 yards on the afternoon. Houston was within one score for the entire second half but could not get over the hump in ending the league’s longest losing streak. No Texans receiver recorded more than 37 receiving yards on Sunday. -Thanks to a 14-play, 80-yard fourth-quarter drive, the Titans moved to two games back in the AFC South. Kendall Wright (103 receiving yards) scored the game-winning touchdown with 10 seconds remaining. Quarterback Ryan Fitzpatrick threw for 320 yards and rookie wide receiver Justin Hunter also went over 100 yards receiving (108), along with catching a third quarter touchdown. The Titans were 10-of-18 on third-down. -The Jaguars won for their second time in the past three weeks with a road victory in Houston on Sunday. Jacksonville running back Maurice Jones-Drew ran for a season-high 84 yards on 14 carries and his first quarter touchdown proved to be the only TD of the afternoon. Quarterback Chad Henne threw for 239 yards and the Jaguars had three different receivers record at least 60 yards receiving. The Jaguars will now play two games in five days beginning on Sunday in Cleveland. NEXT GAME: @Cleveland, Sunday at 1:00 p.m. EST. The Indianapolis Colts today signed free agent safety Corey Lynch to the active roster. Lynch, 6-0, 210 pounds, has appeared in 71 career games, making 12 starts for Tennessee (2013), San Diego (2012), Tampa Bay (2009-2011) and Cincinnati (2008). He holds career totals of 95 tackles (65 solo), 15 passes defensed, five interceptions, one fumble recovery and 48 special teams tackles. In 2013, he appeared in three games with the Titans and totaled three special teams tackles. In 2012, Lynch saw action in all 16 games for the third consecutive season and notched career highs with 47 tackles and two interceptions to go along with eight special teams tackles. In 2010, he played in all 16 games (five starts) for the Buccaneers and registered 24 tackles, one interception, two passes defensed and a career-high 18 special team tackles. The Indianapolis Colts today elevated inside linebacker Josh McNary from the practice squad to the active roster. The team also waived tight end Justice Cunningham and wide receiver David Reed and placed safety Delano Howell on Injured Reserve. McNary, 6-0, 251 pounds, was originally signed by the Colts as a free agent on April 11, 2013. He finished his collegiate career as Army’s all-time leader in sacks (28.0) and tackles for loss (49), while adding 195 tackles (117 solo), nine passes defensed, five forced fumbles and three fumble recoveries. He is the only player in school history to record two double-digit sack seasons and also holds school records for the most sacks in a single game (4.0) and a single season (12.5). Cunningham was selected by the Colts in the seventh round (254th overall) of the 2013 NFL Draft and was signed to the practice squad on September 2, 2013. He was then elevated to the active roster on November 19 and caught one pass for four yards in one game played. Reed was acquired by the Colts in a trade with the Baltimore Ravens on August 21, 2013. He played in seven games this season and returned 24 kickoffs for 590 yards (24.6 avg.). For his career, Reed has returned 63 kickoffs for 1,740 yards (27.6 avg.) and one touchdown in 36 games played. 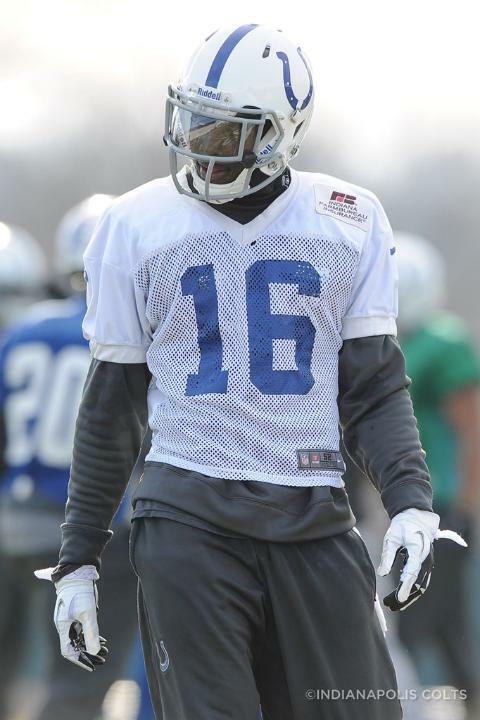 Howell was originally signed by the Colts from the Buffalo Bills practice squad on November 28, 2012. In 2013, he appeared in six games, making three starts and recording 24 tackles (14 solo) and two passes defensed. He also recovered a blocked field goal and returned it 61 yards for a touchdown against Seattle (10/6/13). Throughout the course of the season, Colts.com will run a “Newcomer of the Week” following each regular season game. With the Colts having an influx of the newcomers this season here’s a look at the “Newcomer of the Week” from Arizona. This week’s “Newcomer of the Week” is defensive tackle Ricky Jean Francois. 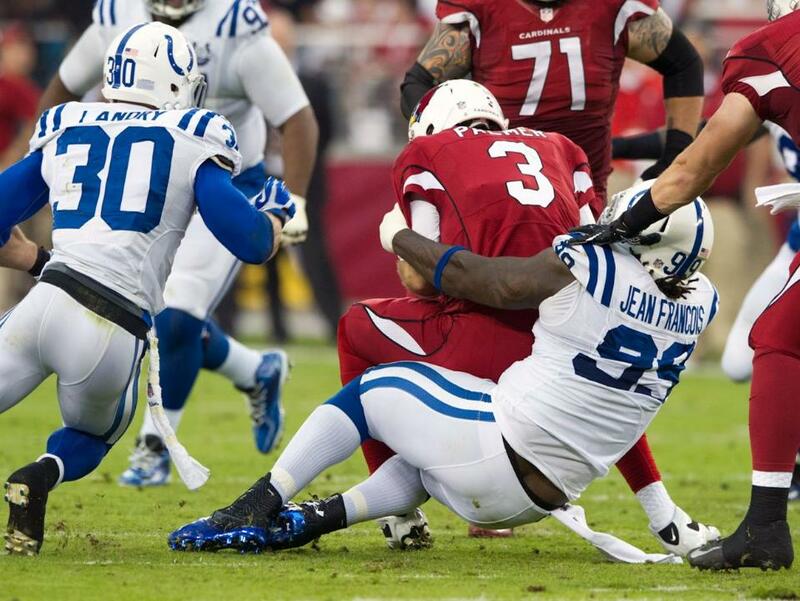 In coming over from the 2012 NFC Champions, Jean Francois has been a welcomed addition to the Colts defensive front. Jean Francois put together his best game of the season on Sunday with five tackles and a career-best 2.0 sacks. The second quarter sack by Jean Francois forced a Cardinals punt and he followed that up with a third quarter takedown of Carson Palmer, which ended that Arizona drive in a punt. After the game, Jean Francois wasn’t one to talk about his individual performance. Jean Francois realizes what it’s going to take to get to the Super Bowl and that means an evaluation across the board. “It’s still the same team,” Jean Francois said after the game. “We are just going to take it back to Indy and we have to break down everything. –Inside linebacker Kelvin Sheppard filled in for 30 of the team’s 75 defensive snaps on Sunday in place of the injured Kavell Conner. Sheppard finished the game with five tackles and one quarterback hurry. –Tight end Justice Cunningham made his NFL debut on Sunday, playing 14 offensive snaps while filling in for fullback Stanley Havili. Cunningham had one catch for four yards on Sunday. –Running back Daniel “Boom” Herron had four carries for 33 yards in the fourth quarter on Sunday and had the Colts second longest play of the day with a 22-yard rush. Andrew Luck made an appearance on the NFL Network on Monday, the day after the Colts’ 40-11 loss at Arizona left them at 7-4. The Colts maintain a two-game lead on Tennessee in the AFC South chase and host the Titans on Sunday in a key contest. A victory Sunday and one in one of the remaining four games (at Cincinnati, vs. Houston, at Kansas City, vs. Jacksonville) would hand the Colts their eighth AFC South crown and the first since 2010. KELLEY’S VIEW: The mood of the fans is of understandable concern, but they should be heartened by the ability of the team to respond to challenges. Four games without Reggie Wayne have added to the difficulty of competing, but a time-tested process is in place that will work with accompanying execution. It’s not a very popular answer, but it is the appropriate one. There are 52 players on the roster in addition to Luck. Each player needs to do his part (Luck and many are), and it’s good to hear leaders pointing toward themselves in saying they must produce at their highest individual level. The margin of error shrunk a little with the Arizona loss, but no goals have been lost. The team controls its own destiny. While the Colts have beaten Tennessee nine of the last 10, half have been by one-score margins. The last three have included comebacks. It will be an exciting day in the stadium. Players want to atone for a 38-8 loss in their last home appearance. Tennessee is one of six teams at 5-6, and they harbor legitimate post-season hopes.